Take Teddy out for the day on the Spa Valley Railway in Tunbridge Wells this Summer! All accompanied children who bring a teddy travel for £1 on the Spa Valley Railway on Saturday 12 and Sunday 13 August 2017 (and teddy goes free!) Normal fares apply to all other passengers coming along for the journey. Everyone visiting the railway on this weekend will travel behind visiting Steam locomotive 'Ring Haw' No.1982 or visiting Class 20 D8188. A timetable with train times can be seen on the railway’s website. Standard Fares will include unlimited travel all day: Adult Day Rover - £12, Child Day Rover - £6 (£1 with a teddy), Senior Day Rover - £11, Family Day Rover - £31.00 To qualify for the £1 child fare you must remember to bring Teddy along and be accompanied by a full fare paying adult! 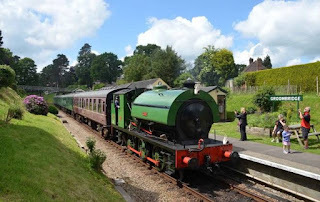 When travelling on the Spa Valley Railway passengers can choose to explore the High Weald by alighting at any of the stations including West Station in Tunbridge Wells, High Rocks, Groombridge and Eridge. Discounts are offered for train travel combined with tickets to view the High Rocks ancient sandstone outcrops opposite the High Rocks Inn or Groombridge Place visitor attraction in the village of Groombridge. Celebrate the Isle of Wight Festival of Sea! Blenheim Palace set for Food Festival!